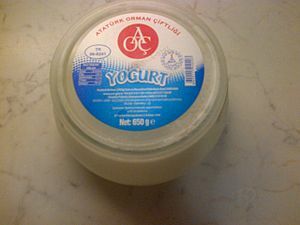 Yoğurt from the "Atatürk Orman Çiftliği" establishments, originally placed at the Atatürk Forest Ranch, in Ankara. 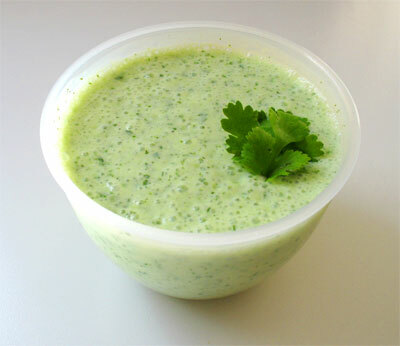 Yogurt, or yoghurt is a milk product made by bacterial fermentation of milk. The lactose in the milk becomes lactic acid when it is fermented. Lactic acid acts on the protein in the milk to make yoghurt thick and sour. The milk is heated to about 80 °C to kill any bacteria present, and to change the milk proteins so that they set together instead of becoming curd. After it is cooled to about 45 °C, the bacteria culture is added, and the milk is kept at that temperature for 4 to 7 hours to ferment. Soy yoghurt is made from soy milk. 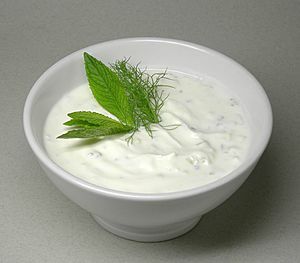 Yogurt is one of the oldest produced foods in human history. No one knows for sure how long yogurt has been around. Today, it is eaten all over the world. It is rich in protein, calcium, riboflavin, vitamin B6 and vitamin B12. In English, the word can be spelled either 'yogurt' or 'yoghurt'. It can be spoken with either a short or a long 'o'. The earliest yogurts were probably made by wild bacteria (yeast infections) and happened by chance. The oldest writings mentioning yogurt were by Pliny the Elder, who said that some people knew how to thicken the milk into something which was sour but tasty. Stamen Grigorov (1878–1945), a Bulgarian student of medicine in Geneva, first examined the bacteria in Bulgarian yogurt. In 1905 he said that it contained a round and a rod-like lactic acid-producing bacteria. In 1907 the rod-like bacteria was called Lactobacillus bulgaricus (now Lactobacillus delbrueckii subsp. bulgaricus). The Russian Nobel laureate biologist Ilya Ilyich Mechnikov, from the Institut Pasteur in Paris, was influenced by Grigorov's work and made a hypothesis that eating yoghurt regularly was the reason why Bulgarian peasants lived for so long. Mechnikov believed that Lactobacillus was needed for good health, and worked to make yoghurt popular through Europe. Yoghurt has a lot of protein, calcium, riboflavin, vitamin B6 and vitamin B12 in it. It is healthier than milk is. Many people who are lactose-intolerant can enjoy yoghurt, because much of the lactose in the milk has become lactic acid. Yoghurt also has medical uses. and in preventing antibiotic-associated diarrhea. Skyr is an Icelandic cultured dairy product, similar to strained yogurt. It has been a part of Icelandic cuisine for over a thousand years. 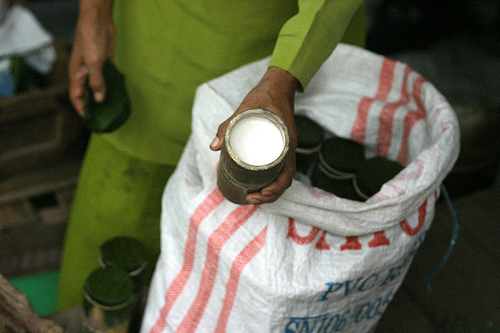 It is traditionally served cold with milk and a topping of sugar. Yogurt Facts for Kids. Kiddle Encyclopedia.